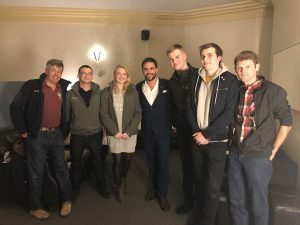 Our ambassador Levison Wood has been busy travelling across the UK, giving talks and lectures to share his tales of adventure and putting in a good word for The Ulysses Trust. Lev has been roaming the length and breadth of Britain with his ‘Journeys through the Badlands and Beyond’ tour. Lev kindly provided a rucksack full of tickets for us to share with some of the units we supported this year. Some of the lucky recipients even got to meet Lev during the interval for a backstage chat (see photos). We’d like to say a big thank you to Lev and his management team for helping us to provide this unique opportunity to the Cadets and Reservists who attended.